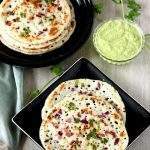 Being a South Indian, Dosai’s are one of our staple Tiffin and dinner recipes. 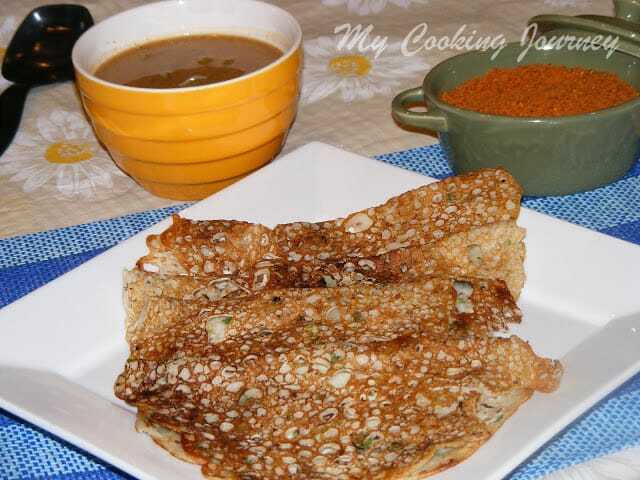 Everyone loves dose in my house and this is one of a different recipe for dosai that does not require the batter to ferment. That means for people like me who forget to grind the batter a day or so earlier, so that it can ferment, this is a perfect recipe. This is sort of an instant dosai, but not quite. 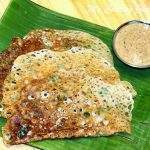 Instant dosai’s are something that is made by mixing flours and using them right away. This one requires us to soak the rice and dals for few hours before we could grind them. Adding tomatoes to the dosai, gives it a nice vibrant color and a tanginess that works really well flavor wise. The addition of ginger works really well, so I would highly suggest that you do not omit that. 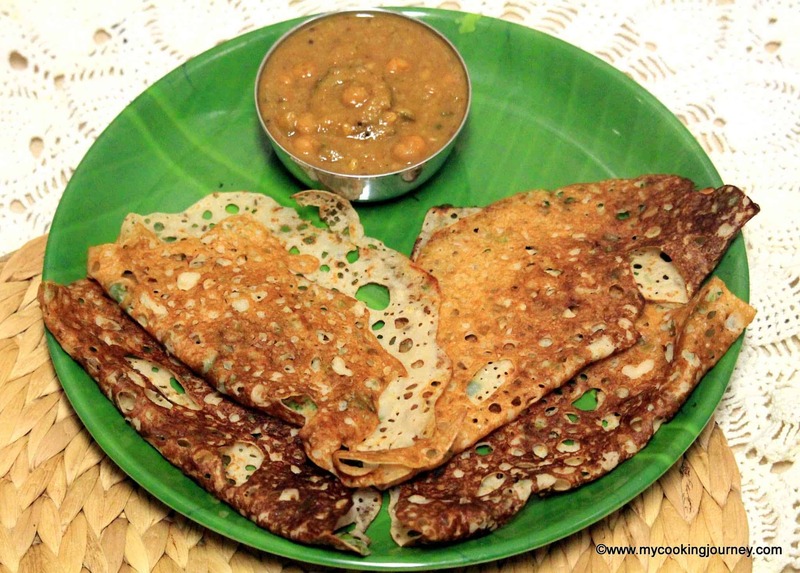 If you are making this for breakfast, you could soak the rice and the dal overnight and grind them in the morning. Wash and soak the dal and rice for at least 3-4 hrs. 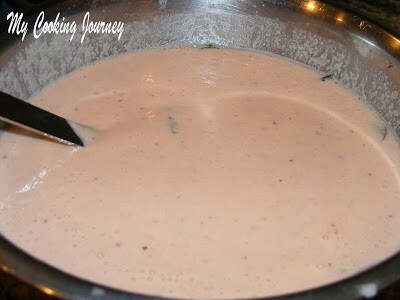 Grind them in the blender along with the rest of the ingredients (except the oil) to a sort of smooth batter. When grinding, cut the tomatoes into quarters for easy grinding. 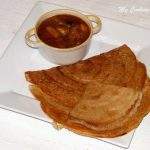 Like I already mentioned, ginger adds a very wonderful flavor to the dosai, so try not to avoid it. 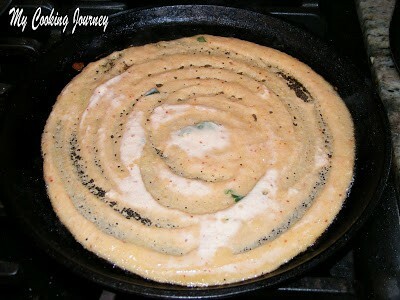 Heat a tawa/pan/griddle on medium high and when hot pour a ladle and a half of batter in the center of the pan and using circular motions push the batter towards the outer edge and form a dosa. 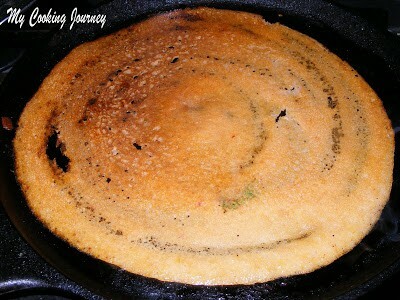 Add about a tsp of oil surrounding the dosa. Let it cook until it is golden brown and then flip over to the other side. Let it cook on the other side too and then remove it from the pan. Repeat with the rest of the batter. 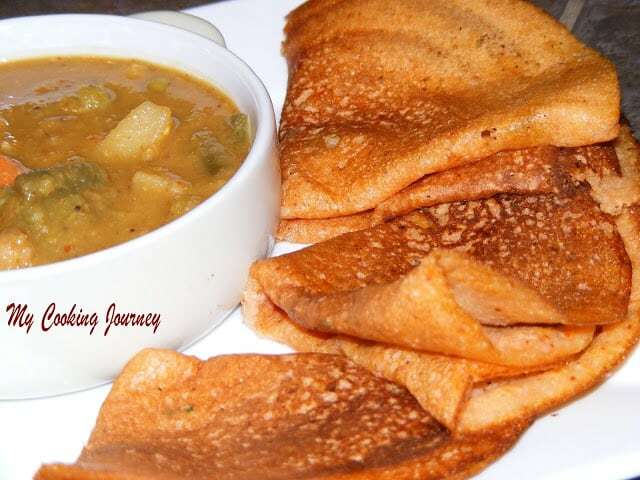 Serve with chutney or sambhar of your choice. 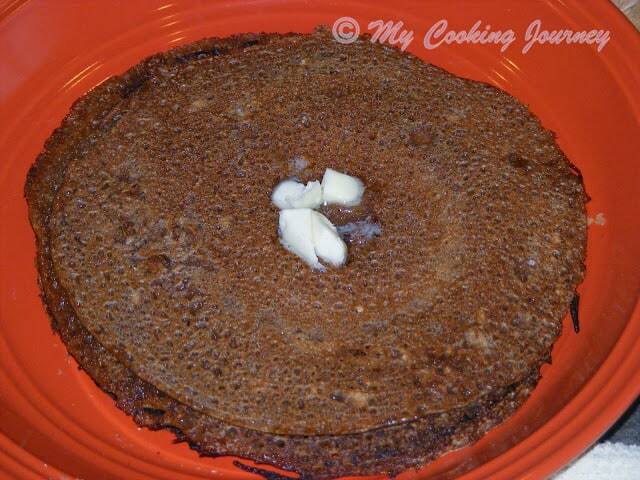 When making dosais, it is helpful to use a paper towel with a touch of oil to clean the griddle in between. 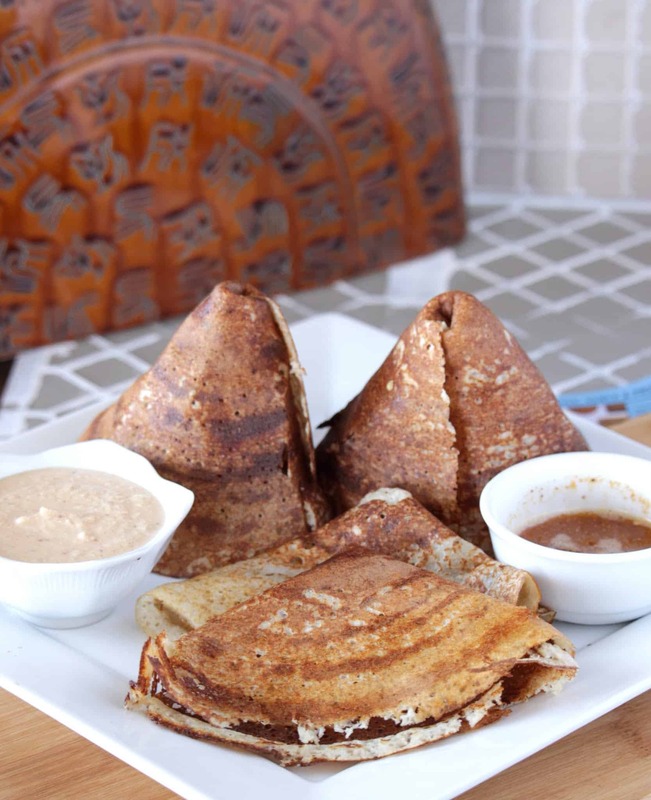 To keep the dosais warm until serving you could leave it in a preheated oven until ready to serve. 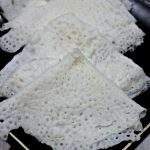 I would suggest not leaving them in a hot pack because it takes away the crispness of the dosais. 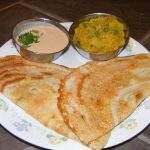 Thakkali dosai looks really yumm Sandhya. That is just amazing!!! thanks for sending it to my event… looking for more yummy recipes!!! Thanks Meena Aunty! 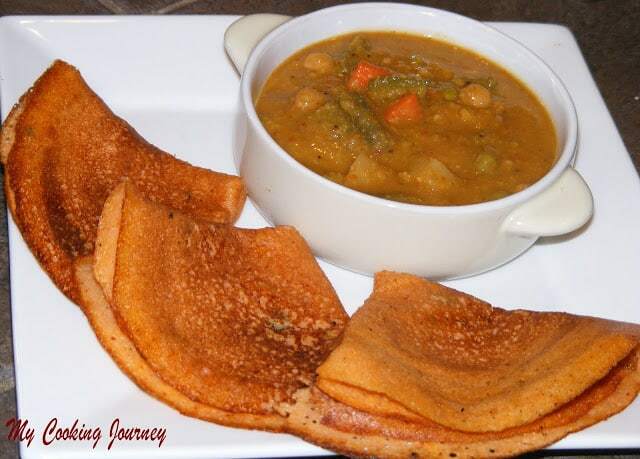 It was a sambhar with mixed vegetables 🙂 This dosai would be very easy for you to make. Does not require you to ferment and you don't need a grinder. 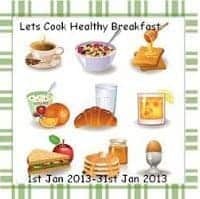 Easy and healthy breakfast.New year wishes to you and to your family and thanks for linking to the event dear..
Hi sandhya I'm thinking of different breakfast tomorrow since its holiday and also it takes minimum of 24hrs for fermentation due to weather so this will help me a lot because we r also dosai family. 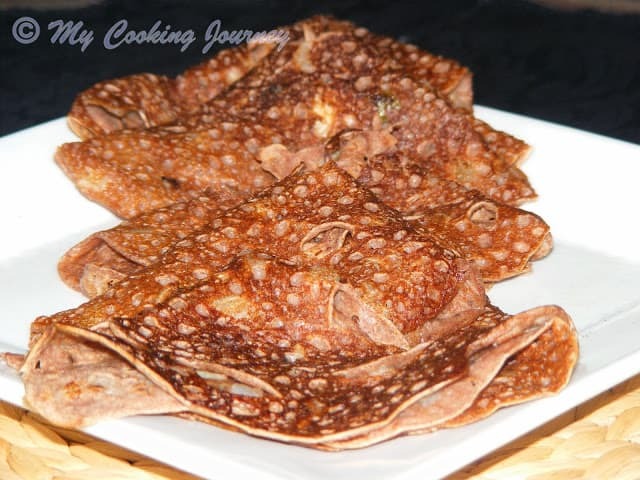 yummy dosa…I always like to eat,but havent try at home.Scared of failing.Now I feel like I can try with step by step instructions…thanks for linking with the event…. 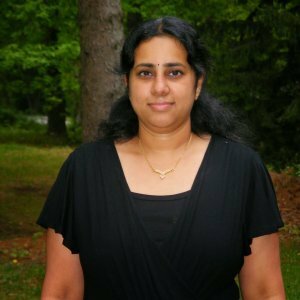 Inviting red dosa. 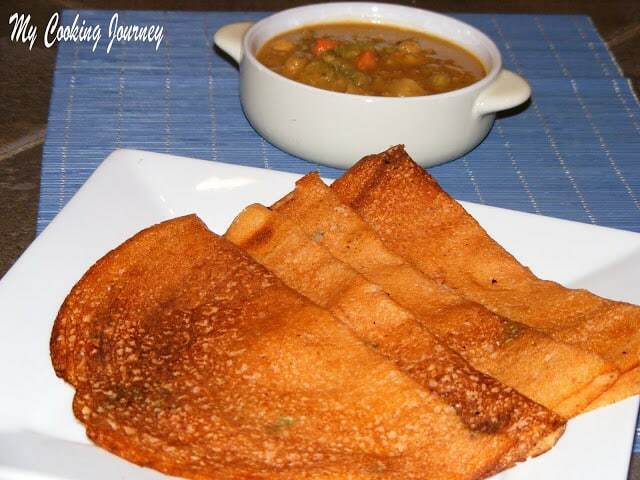 The family loves dosa :). Ha ha!Nice blog. Thanks for sharing it here.